Since owning an iPhone, I've seen and played my fair share of bad games on this Smartphone and many of these titles fortunately come from overseas. If I had a dollar for each bad app available on the iPhone, I think I would be a rich man but interestingly enough, many of the titles produced in Australia such as Fruit Ninja have actually been quite decent. 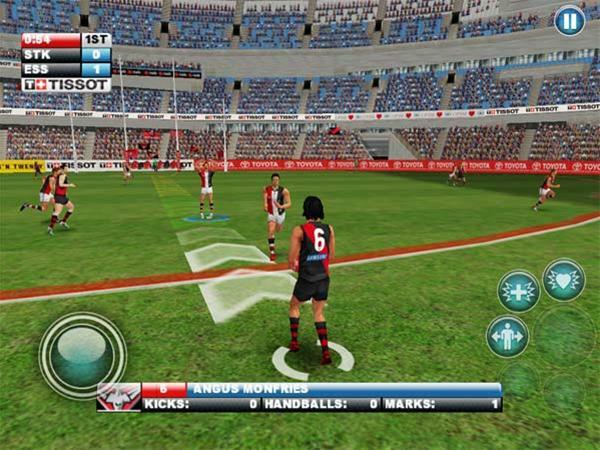 So needless to say when I heard that there would be "another" AFL game on the iPhone, I was a little apprehensive because no one has really cracked this sporting genre perfectly. However when I heard that Wicked Witch Software were responsible, the creators of AFL for the Nintendo Wii, my hopes for a good Australian Football League game was looking up. 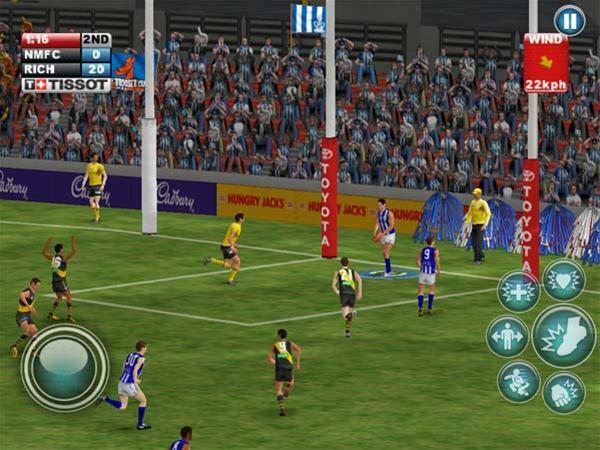 After installing the game on my iPhone 4S, I was treated to a very slick interface that was reminiscent of the Wii version and even featured the song Holy Grail by Hunters & Collectors.Before jumping into the game, the first thing you need to do is create your player profile and once completed, you can then start playing AFL Gold Edition. The game offers a variety of gameplay modes that include Quick Match, Custom Match, Career Manager, Competition and other fun options such as a Team Editor and a list of Achievements. Best of all, this is an officially sanctioned AFL products which means all the official teams of the AFL are included in the game and even the players! The Career Manager is also quite cool as it allows you to go behind the scenes as a "Manager" but still allows you to play. After creating my profile, I jumped straight into the Quick Match which automatically picks your teams but this can also be changed by the player, including the Guernseys of your team. It also gives the player a rating of the teams that you play out of 100% which is based on the 2011 AFL ladder. By clicking on Team stats, it breaks down this percentage into a number of key AFL attributes such as attacking (e.g. handball), defending (e.g. tagging) and movement (e.g. marking). Rather than fiddle with the game, I decided to go with what the app chose which was the Brisbane Lions (66%) and the Gold Coast Suns (69%). The game took place at the SCG in wet weather conditions and to compound the situation, the wind was around 25 kph which needed to be taken into consideration. Once in the game, the touch screen works surprisingly well for an AFL game. There is a virtual thumbstick to control your player and there are a number of options available to the player that include handball, kick, mark, tackle, pick up ball, punch, hip & shoulder, soccer, evade, aggression, technique and cycle player. Although the game does allow for basic controls, there are several advanced controls also available such as different kicks (e.g.. torpedo and drop punt) to performing speckies and all sorts of AFL thoroughly cool manoeuvres. 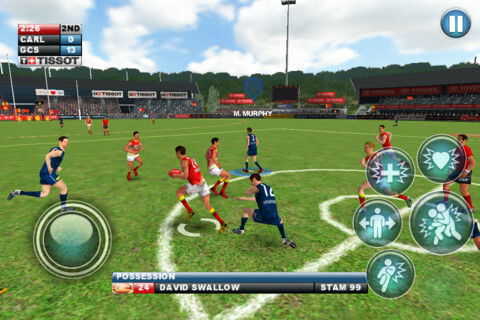 The in-game icons which allows you interact with the game when you don't have the ball include Technique (allows you to perform advanced moves), Aggression (increases power of your player), Cycle Player (change between players), Mark, Hip & Shoulder (bump or shepherd another player) and Soccer (allows you to soccer the ball without picking it up). When you have the ball or performing another facet of AFL, these icons change in order to give the player a diverse and authentic AFL experience. With that said, I was actually quite surprised at how accurate and responsive the controls were and when I kicked by first goal which happened quite early in the game, I was over the moon. What I do like about the difficulty in AFL Gold Edition is the ability to tweak the intricacy of the title and length of quarters. This ensures that gamers of all different levels can easily get into the game and start playing with more seasoned veterans having the ability of upping the difficulty for a real challenge. Although this review briefly scratches the surface of this game, it's easily one of the better AFL experiences that I've had the pleasure of playing and although it's not perfect, it's quite close. Some issues that I have noticed with the first release of this game are the menus which are sometimes a little unresponsive and fiddly to use. It's almost like this game has been ported directed from the Wii in this regard. However, for the most part, the responsiveness of the gameplay is quite good but due to the size of the iPhone screen, the play does become a little cluttered, especially when there are too many players around. Even so, this will keep most AFL fans extremely happy during the summer and hopefully upcoming patches will bring out a 2012 ladder. The only other issue that I had with this app for the iPhone 4S were the loading times. Considering that I have the best iPhone available, it is a little slow in loading games but hopefully this will be addressed later on. Graphically, AFL looks brilliant on the iPhone 4S and definitely mimics the Wii version in terms of a quality presentation. The stadiums look authentic and all the players are extremely well animated plus the game uses some great camera angles. The weather effects and lighting looks quite realistic and there were no issues at all with the graphics whatsoever. Sound effects replicate all the real-world sounds of Football well, especially the crowd and awesome commentary but unfortunately the main menu song (Holy Grail) does become a little too repetitive. This review has just scratched the surface of this game and if you're looking for your AFL fix, than here it is. Whether you're playing a 2.5 minute quarter or something considerably longer, the game can be tweaked to suit the player. However where this game shines is through the strong gaming engine that works perfectly on the iPhone. Add in the official AFL branding and awesome graphics and AFL Gold Edition once again proves that Australia are on the top of their game when it comes to iOS apps!